Comes in a large multi cd case. Advance Limited Edition 2-CD+DVD Special Collectors Edition . 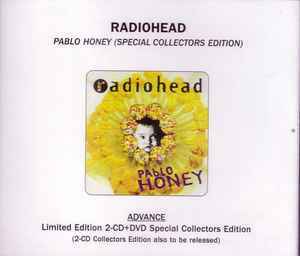 On March 24, Radiohead's first three albums, Pablo Honey (1993), The Bedns (1995) and OK Computer (1997) will be released by Capitol/EMI in expanded "Collectors Edition" and limited edition "Special Collectors Edition" packages. Each "Collectors Edition" includes the original album plus a second CD of rarities, including demos, sessions and live recordings. Each "Special Collectors Edition", in deluxe, lift-top box packaging, includes both audio discs and adds a DVD with a variety of promotional music videos, TV perfomances and filmed concert perfomances, as well as a series of postcards. This compilation ℗© 2009 Capitol Records, Inc. Manufactured by Capitol Records, Inc. Licensed for promotional use only. This disc has not been sold.